Marie Colvinwas an internationally recognized American foreign war correspondent who was killed in a rocket attack in 2012 while reporting on the suffering of civilians inside Syria. She was renowned for her iconic flair and her fearlessness: wearing the pearls that were a gift from Yasser Arafat and her black eye-patch, she reported from places so dangerous no other hard-core correspondent would dare to go. Paul Conroy, who had forged a close bond with Colvin as they put their lives on the line time and time again to report from the world’s conflict zones, was with her when she died. Under the Wire is Paul’s gripping, visceral, and moving account of their friendship and the final year he spent alongside her. When Marie and Paul were smuggled into Syria by rebel forces, they found themselves trapped in one of the most hellish neighborhoods on earth. Fierce barrages of heavy artillery fire rained down on the buildings surrounding them, killing and maiming hundreds of civilians. Marie was killed by a rocket which also blew hole in Paul’s thigh big enough to put his hand through. Bleeding profusely, short of food and water, and in excruciating pain, Paul then endured five days of intense bombardment before being evacuated in a daring escape in which he rode a motorbike through a tunnel, crawled through enemy terrain, and finally scaled a 12-foot-high wall. Astonishingly vivid, heart-stoppingly dramatic and shot through with dark humor, in Under the Wire Paul Conroy shows what it means to a be a war reporter in the 21st century. His is a story of two brave people drawn together by a shared compulsion to bear witness. Tears, Tears and then more tears. 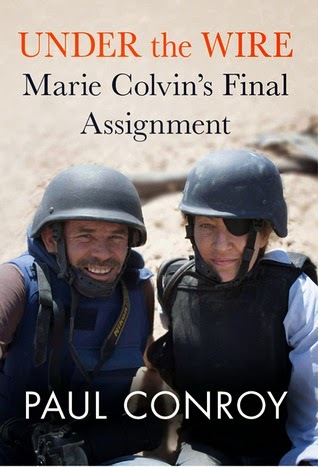 This story of Marie Colvin, a journalist, is told from her friend, Paul Conroy, a photographer, who spent his last days with Marie. We don't always hear about the other people who put their life on the line every single day to bring us stories and footage of what goes on in other countries. Reading Paul's story opened my eyes on what he, Marie and other reporters, photographers and journalists go through. They risk their lives every day. It's sad. They're stories are not often told. This story brings us in to what both Marie and Paul went through during Marie's last few days of both her and Paul being trapped. I couldn't put down the book, it captivated me and had me going from chapter to chapter wanting to know what else happened. I love that they added photos that showed us from the time they were there until the time you see Paul on a plane with heading back home to the UK. Disclosure: All opinions are my own. I received Under The Wire at no cost for the purpose of this review. No other compensation was received.